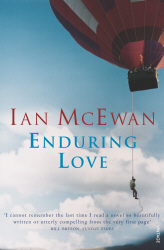 Ian McEwan is the author of two collections of stories and twelve previous novels, including Enduring Love, Amsterdam, for which he won the Booker Prize in 1998, Atonement and, most recently, Solar. One windy spring day in the Chilterns Joe Rose’s calm, organised life is shattered by a ballooning accident. The afternoon, Rose reflects, could have ended in mere tragedy, but for his brief meeting with Jed Parry. Unknown to Rose, something passes between them – something that gives birth in Parry to an obsession so powerful that it will test to the limits Rose’s beloved scientific rationalism, threaten the love of his wife Clarissa and drive him to the brink of murder and madness.